By default, Windows 10 configures your system so that it sends a generous amount of diagnostic and feedback information, including error reports that could inadvertently contain personal information. If you are concerned about data use or privacy, you can dial back the amount of diagnostic information by using the Feedback & Diagnostics page under the Privacy heading in Settings. Figure 17-5 shows the default settings. If you're concerned about sensitive data leaking out as part of diagnostic reports, consider changing the Diagnostic And Usage Data setting from its default of Full. The Feedback frequency setting at the top of this page controls how often Microsoft asks you about your use of features. If you prefer to be left alone, set this to Never. • Basic. This level includes data that is fundamental to the operation of Windows and Windows Update. It includes information about the capabilities of your device, what is installed, and whether Windows is operating correctly (which includes sending basic error reports to Microsoft). No personally identifiable information is included. • Enhanced. 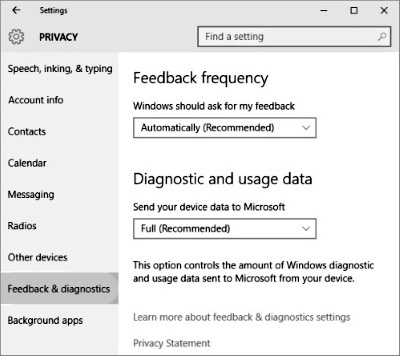 Along with the data sent with the Basic setting, this setting adds data about how you use Windows (how often you use certain features or apps, for example) and collects enhanced diagnostic information, such as the memory state of your device when a system or app crash occurs. Information sent to Microsoft also includes reliability data for devices, the operating system, and apps. The basic report that Windows Error Reporting transmits typically includes information such as the application name and version, module name and version, exception (error) code, and offset. Hardware reports include Plug and Play IDs, driver versions, and other system details. The likelihood that any of these items will convey personally identifiable information is essentially nil. The process does transmit your IP address to a Microsoft server, but Microsoft's privacy statement asserts that the IP address is used only to generate aggregate statistics and will not be used to identify you. In work environments, your network administrators will almost certainly disable the sending of advanced error reports that might inadvertently disclose confidential information. This is an excerpt from Windows 10 Inside Out which shows you the many tools that Windows provides for diagnosing errors and recovering from problems.